Raspberry Pi Lunchbox Retro Arcade #piday #raspberrypi @Raspberry_Pi « Adafruit Industries – Makers, hackers, artists, designers and engineers! Never mind a packed lunch, have a Pac-Man lunch with this mini retro arcade in a box. Having already built a full-size tabletop-style arcade cabinet powered by a Raspberry Pi, Daniel Davis wanted to make something a little more portable to feed his passion for retro gaming. So when he acquired an old metal lunchbox, the last thing on his mind was using it to store sandwiches. 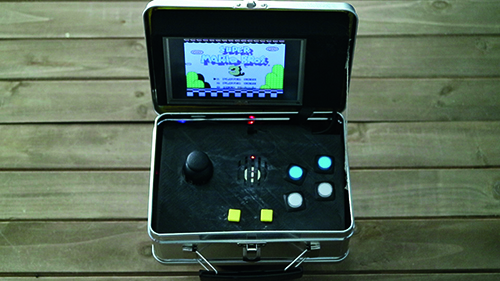 Instead, he opted to pack it with a retro arcade system built using a Raspberry Pi 3, Adafruit Backpack 5-inch HDMI touchscreen, Adafruit Arcade Bonnet, speaker, plus an analogue joystick and mini arcade buttons.